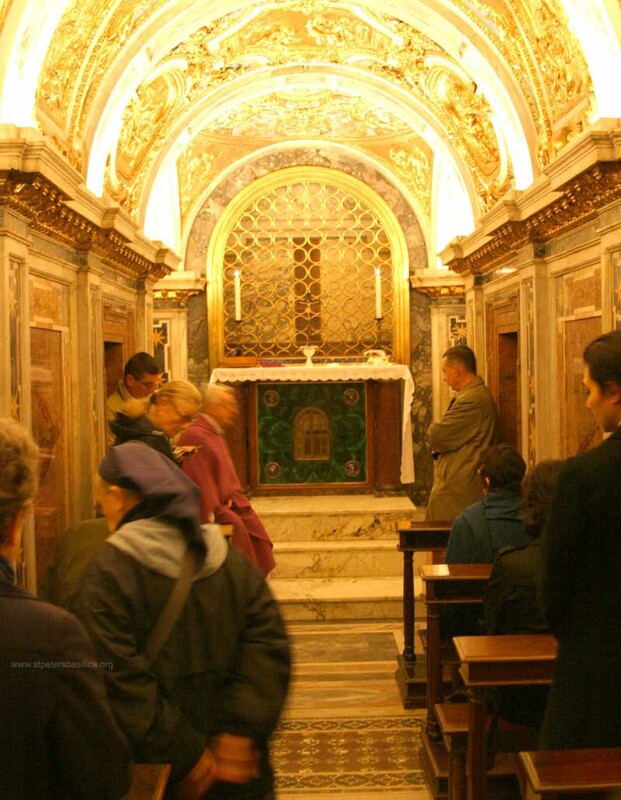 In the center of the peribolos is the Clementine Chapel, the gem of the Vatican grottoes and the precious chest protecting the sepulcher of St Peter. The center of the room coincides with the "subterranea Confessio" built at the end of the 6th century by Popes Pelagius II and St Gregory the Great. Together with the niche of the Pallia, it is the only part of the old basilica to have preserved its original identity and function. 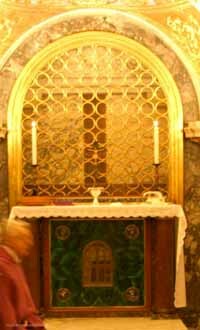 The faithful used to come here, the way they still do today, to the back of the Constantinian monument above the tomb of Peter, where, they believed, was the head of the Apostle. This is what a brief guide already in the 8th century, says: "Eventually, through the crypt, you will reach the side of the head (ad caput) of the Blessed Peter, the prince of the apostles." During the first millennium, it was here that solemn oaths were sworn, donations to the Church were made, the Pallia of the Archbishops were blessed and grand treaties and acts of reconciliation were sanctified. The pontiff with clerics would come on the eves of important functions and sing the first part of the the nocturnal offices. A number of lamps remained lit day and night as a sign of veneration of the Apostle. Starting from 1592, the ancient chapel was modified and embellished by Clement VIII and was named Clementina. The area of the altar was enlarged and raised. The center was prolonged toward the back and joined to the new peribolos and, on the sides, two short sections of the old peribolos were added and gave the chapel the shape of the upside-down cross of Peter. The floor was lowered and a new barrel vault was built. 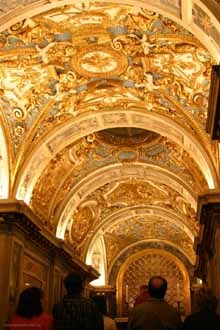 In addition, pope Clement VIII had his oratory enriched by decorating the walls with precious marbles and gilded stuccos that can still be admired today. Behind the altar, protected by a gilded bronze grid, are the remains of the Memoria Petri, the monument built by Constantine to protect the mortal remains of Peter. 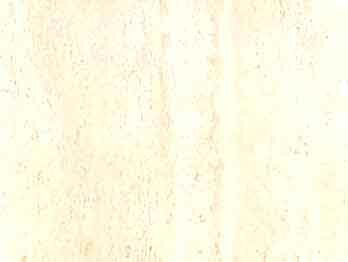 It is built of two slabs of pavonazzetto marble separated by two porphyry strips. On top of this structure is the base of the altar built by Calixtus II and consecrated in 1123. Prior to the present-day arrangement that dates from the pontificate of Pius XII, the back of the chapel was decorated by an icon representing Peter and Paul and reproduced in mosaic in 1879. The small altar is located on a raised platform with 3 steps. It sits on 2 porphyry columns and its frontal is faced with malachite affixed with four bronze and lapis lazuli studs. Inside the facing, visible through the opening in the front, is the original brick structure of the altar built in the 7th century, after the construction of the crypt. Pope Pius XII in person consecrated the altar on June 5, 1950, to inaugurate the new layout of the chapel and the grottoes and to crown the archeological explorations that brought to light the tomb of the Apostle and the necropolis under the basilica. In the lunettes on the sides of the altar are two inscriptions. The one to the left commemorates the brief of Benedict XIII of March 21, 1727, which concedes to the priests celebrating Mass close to the body of Peter the possibility to obtain plenary indulgence to free the deceased from Purgatory. The other inscription commemorates the concession given by Pope Gregory XVI on June 17, 1836, to celebrate Mass at this altar in honor of St Peter at any time, except on solemn festivities. During the restoration, two side entrances were made to reach the archeological remains of the Confessio. In 1952 two decorative bronze doors were made. Both bear the crest of the Fabbrica di San Pietro and the date of the Jubilee Year of 1950. On the left door is a quotation from St Leo the Great, on the right door from St Hilary. Some remains of the ancient Cosmatesque marble decoration can still be seen in the paving and in the center of the floor is a grid to provide air to the excavations underneath. 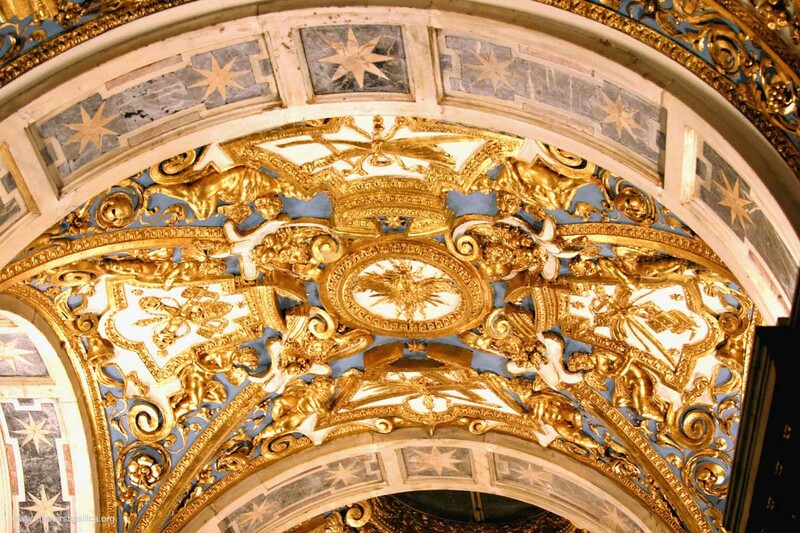 The walls are faced with precious marbles and the dominating decorative motif is the eight-point star from the papal crest of Clement VIII Aldobrandini. The vault is decorated with golden stuccos on an indigo background. 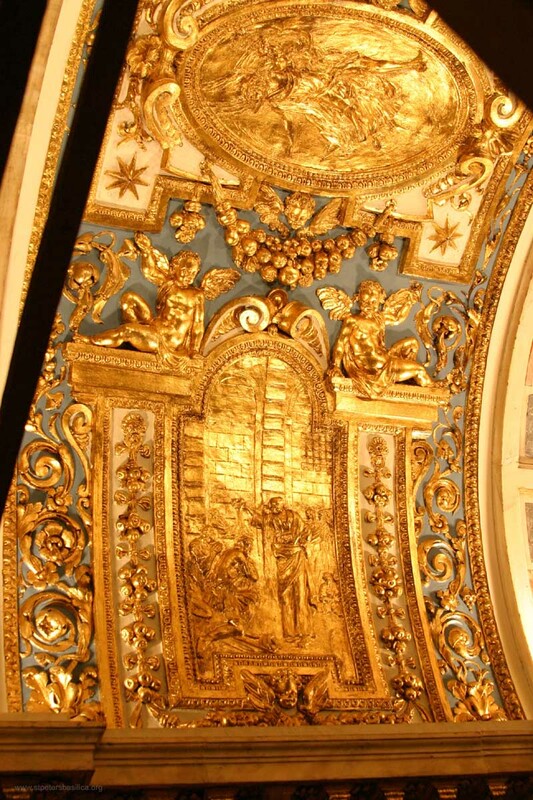 The ovals and rectangles inserted between floral motifs and figures of angels represent stories of St Peter. 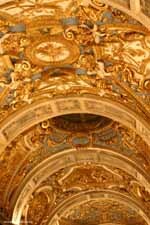 Originally, the vault was decorated with a series of bronze bas-reliefs by Ruggero Bescape (1598-1599). 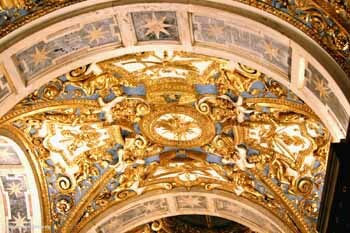 They were restored by Alessandro de'Rossi (1649-1650) and by Luigi Vanvitelli (1750) who used new stucco scenes by Giovanni Battista Maini. The bas-reliefs form an iconographic study centered on the life of Peter as it is known from the Gospels, the Acts of the Apostles, and the Apocryphal Acts. They are presented in a random order. Starting from the side of the altar, at the base of the little false dome, from the left are the four scenes of: The Flogging of Peter, ordered by the Sanhedrin after the announcement of the resurrection of Jesus (Ac 5,40-41). To the right is The Flogging of Paul by the Jews (2 Co 11,24-25). In front of the altar to the left is Concordia Apostolorum, the embrace of Peter and Paul after the dissent in Antioch (Ga 1,18); to the right is Quo Vadis?, the encounter of Peter and Jesus on the Old Appian Way (Apocr). In the first span from the altar is: to the left The Denial of Peter (Jn 17,17-18); in the center: Jesus Confers the Primacy on Peter (Jn 21,15-17); to the right: Peter Cuts off Malchus's Ear (Jn 18,10-11). In the preceding span, to the left is Ananias and Sapphira at Peter's Feet (Ac 5,1-2); to the right The Burial of the Decapitated Paul (Apocr). 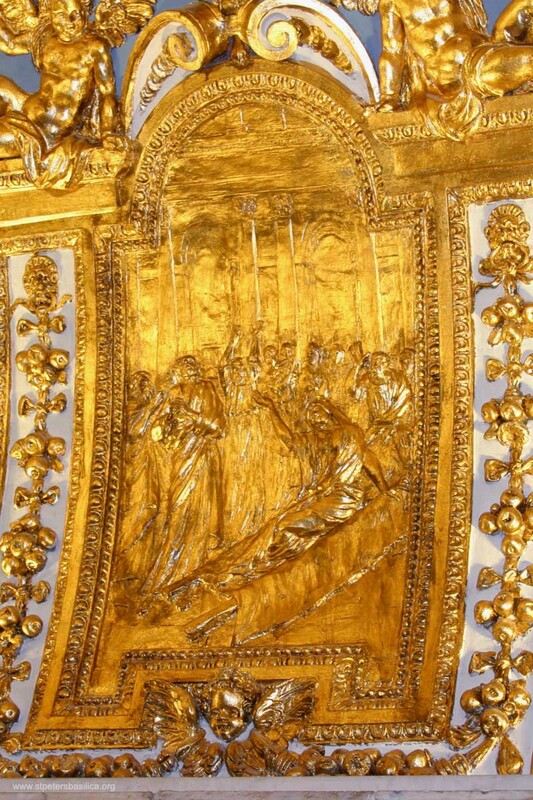 In the left wing, in the oval above the marble table is Peter in front of Nero (Apocr) while in the upper lunette is The Calling of Peter on the Lake (Lk 5,10-11). On the small vault, to the left: The Handling of the Keys to Peter (Mt, 16,19); to the right: Peter after the Miraculous Draft of Fish (Lk, 5,8-9). In the right wing, in the oval above the marble table is St Peter on His Way to Martyrdom (Apocr) and in the lunette above: Peter Saved by Jesus on the Water (Mt, 14,30-31). On the small vault to the left is: Peter Heals the Cripple (Ac, 3,6-7), to the right: Peter Heals the Infirm (Ac, 5,15). 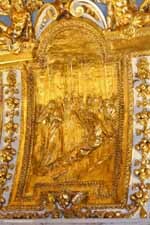 On the first section of the vault, to the right from the entrance, is Peter Baptizing Cornelius the Centurion (Ac, 10,47-48); in the center in a small oval, is An Angel with a Palm; to the right, The Raising of Tabitha (Ac, 9,40-41). The original gate of the chapel was by Simone Ponzio. 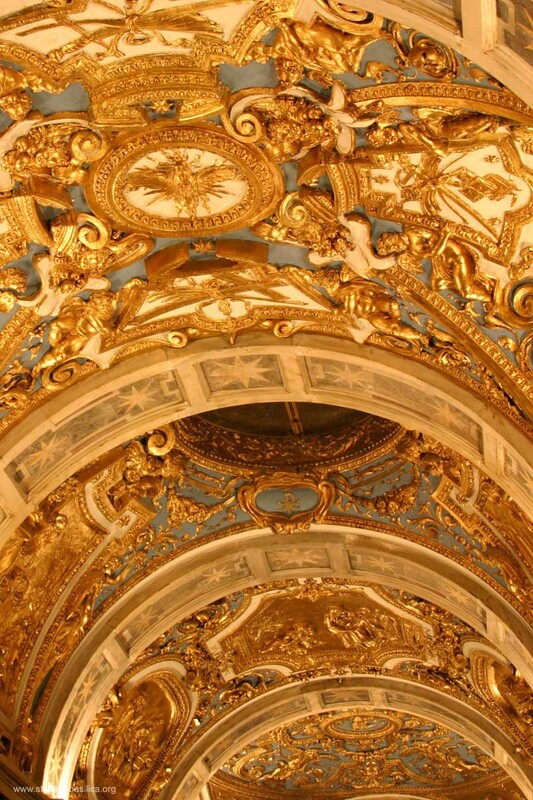 The present decorative gate in gilded bronze is the work of Ridolfo Panfili (17th century). 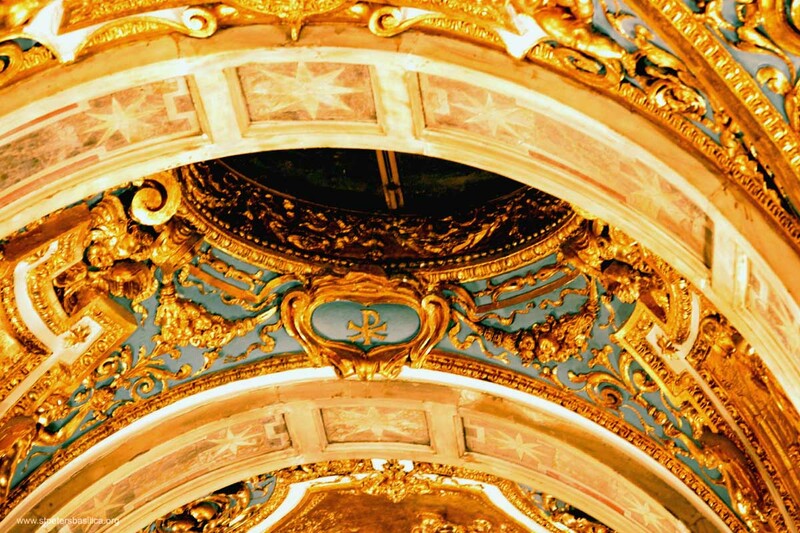 Leaving through the gilded baroque splendor of the Clementine Chapel, you can't help but think that what we've just seen and touched and smelled is about as close to the apostolic roots of the Catholic Church as it's possible to get.